Flyaway Productions presents the world premiere ofGive a Woman a Lift, an aerial dance co-created by Jo Kreiter and Sean Riley, with original music by Jewlia Eisenberg. Pictured: Christine Cali. Photo by Nathan Weyland. Click here for the Press Release or High Resolution Images. 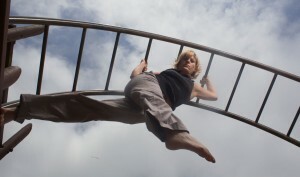 SAN FRANCISCO, CA, July #, 2013 – Flyaway Productions is proud to announce the world premiere of Give a Woman a Lift, a visually arresting aerial dance created by choreographer Jo Kreiter and visual designer Sean Riley. In an exploration of the meanings inherent in the idea of “going up,” especially as seen through a feminist lens, Give a Woman a Lift affirms the necessity of rising on one’s own steam, rather than waiting for others to push or pull us up. Give a Woman a Lift opens Friday, November 8, 2013 at the Joe Goode Annex in San Francisco, and runs through Saturday, November 16. In Give a Woman a Lift female self-determination is physicalized on multiple planes. Co-created by Kreiter and Riley, each taking part in the visual and movement design of the piece, Lift continues the duo’s long-standing experiment in the relationship of space, ascension and velocity. Invented scenic elements using repurposed steel and suspended, dynamic lighting support an articulate off-the-ground movement vocabulary. Joining the creative team behind Lift is composer and vocalist Jewlia Eisenberg. Eisenberg’s original score for Lift will be the company’s 20th commissioned score for a female composer since its founding in 1996. Returning company members Jennifer Chien and Patricia Jiron join new dancers MaryStarr Hope, Lisa Fagan,Becca Dean and Christine Cali in Lift. The world premiere of Give a Woman a Lift is made possible by the Rainin Foundation, Center for Cultural Innovation, Zellerbach Foundation, Grants for the Arts, and Flyaway’s generous individual donors.